Midway through the Lightning-Bruins matinee on Monday, the NHL's leading scorer, Steven Stamkos, left the game on a stretcher with a leg injury. While backchecking during a Boston scoring chance he lost his balance while fighting for position with Dougie Hamilton and his right leg collided awkwardly with the goal post. The Bruins would score twice in 20 seconds minutes later to take a 2-0 lead and later added an empty-netter to seal a 3-0 victory. 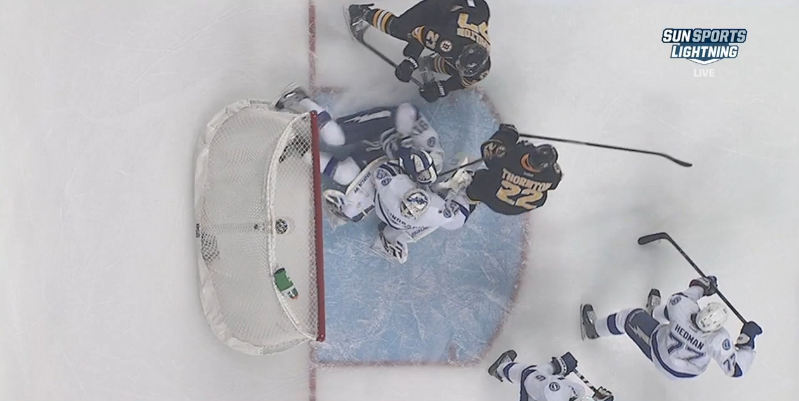 No word yet on the severity of the injury, but given the way Stamkos reacted, it doesn't look good. Everything's gone right for the Eastern Conference-leading Lightning in the opening month of the season and missing their leading scorer for any period of time would be a huge blow. You can also imagine Team Canada officials are concerned as well. Stamkos was left off the 2010 roster and, if healthy, would be a shoo-in for the Sochi Games. The last update from the Lightning was that Stamkos was undergoing X-rays at a local hospital. He has played 344 straight NHL games.